Flooring throughout your home gets a great deal of use. In addition to this, it has to look great and complement the rest of your home's decor as well. Let the articles at LoveToKnow Home Improvements give you the information you need to choose, install and maintain the floors throughout your home. Kitchens: There are numerous choices for kitchen floors, including low-maintenance linoleum and beautiful, natural hardwoods. Bathrooms: Your bathroom flooring needs to stand up to moisture, while also being non-skid. Learn the best materials and patterns for your bathroom. Garage: Garage floors need to handle a lot of traffic and abuse, but that doesn't mean they can't look good as well. Get the facts you need to make an informed choice for your garage. Floating Floors: Learn how to install laminate floors and get the facts you need on specialty floating floors, like cork. Tile Floors: There are lots of types of tile floors, each with their own installation and upkeep. Learn to install ceramic, mosaic and even natural stone tile flooring. Vinyl Floors: Learn to install and also to remove vinyl floors for an inexpensive face lift to any area of your home. Hardwood Floors: Hardwood floors have a lot of special needs. Learn how to install them, refinish them and even paint them to get the best look for your home. 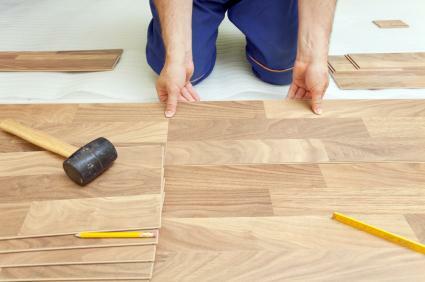 Flooring is an integral part of every room in your home. Make the most of it and let the articles within LoveToKnow Home Improvements be your guide to the right information.